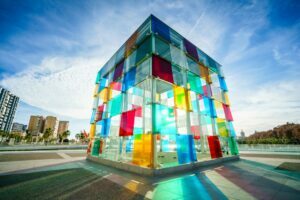 Malaga is a bustling city and a cultural hub of activities! If you are however here completing your Triniy CertTESOL course at TEFL in Spain then you may be trying to watch the pennies! 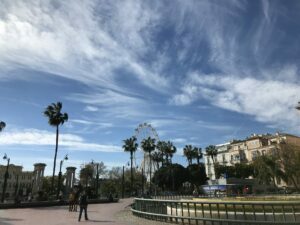 For this reason we have come up with a great list of free things to do in the fantastic city of Malaga! Looking to do some exercise? 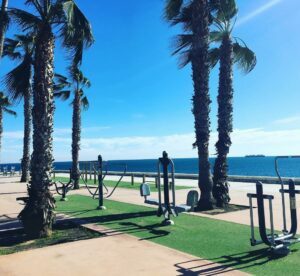 Instead of paying for the gym, why not try one of the many outdoor gyms in Malaga? It’s free and you can admire the fantastic views at the same time! You can also download an app called “ Zones Muscular” to see all of the locations of the outdoor gyms around the city. And I can tell you, there are a lot of options! 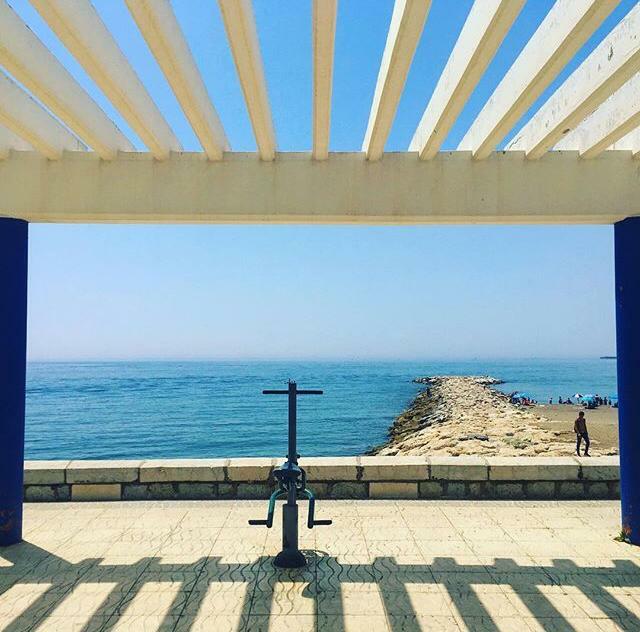 Some gyms that close to TEFL in Spain (so that you can even workout while you are on your TESOL course): Plaza de la Solidaridad, Calle a Union, Parque de Huelin and one close to the beach. 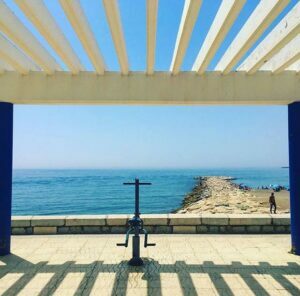 Get some exercise and a tan at the same time, who would not want to do that right? Costa del Sol, means the Coast of The Sun. This is what Andalucia, the region of Spain, is known best for – with on average 300 sunny days a year! If you love the beach, then Malaga is the perfect choice for you and you will be amazed by how many other attractions it has to offer! On every beach you can find beach bars – also known as Chiringuitos, where you can enjoy the view, fresh seafood (especially the barbecued sardines called Espetos Sardinas) and drink some vino tinto (a typial summer drink of red wine and lemonade). There is no better way to enjoy your time during a sunny afternoon! The beach Playa de la Misericordia is located near t he raining centre TEFL in Spain. Malagueta Beach (known as the tourist beach) is just a 20 minutes walk from the school and situated just in front of the city centre. This is the best beach to head to if you want to play some volleyball! 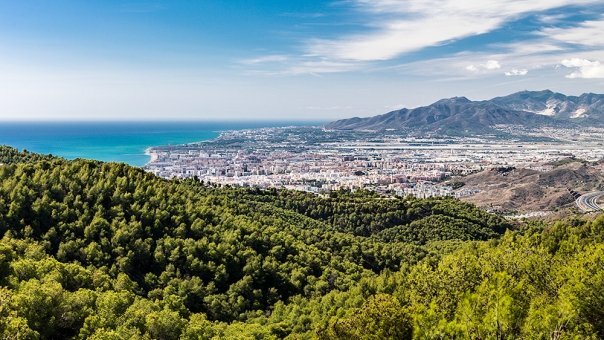 The Montes de Malaga (or mountains on Malaga) are the best place to go if you want to be surrounded by nature. The mountains located only a few kilometres outside the center. There you can find many plants species, birds and reptiles. There are also some traditional restaurants located nearby, where you can try the famous traditional plato de los montes (A generous plate of fried, seasoned breadcrumbs, a piece of Lomo (cured pork), some Spanish Chorizo and a fried egg topped with a roasted green pepper). Not for the faint hearted, that is for sure! The fastest and best option is to rent a car or get a taxi. But it’s totally worth it, especially if you love nature and being outdoors! While being in Malaga, you can’t miss the chance to see the Botanical Gardens. Built in 1885 and steeped in history, being the property of several different families. 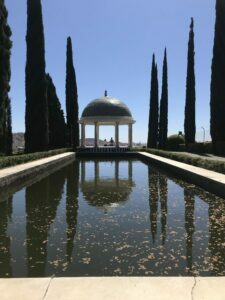 The Gardens have been open to the public since 1994 and should definitely be on your must-see list once in Malaga! It’s a very peaceful place, you can walk among the plants, trees and beautiful flowers for hours and you still won´t have seen everything. from the Atarazanas Market. Once you get off at the last stop it’s a 15 minute walk. The walk is really easy, you only need to follow the green path and you will see the garden! The bus ride is only €1,30. Hint: you can only pay in cash on the bus, either with the exact change or a €5 note. Museo del Patrimonio Municipal is located at the end of the Paseo del Parque near the road tunnel. It’s a modern-looking glass building with five floors. In this museum you can find historic artifacts, documents and works of art, paintings and sculptures. It’s arranged in chronological order, you start from the lower floor and move upstairs. You can find various exhibitions in the museum. 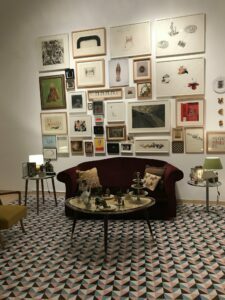 Until the 30th of April there is an exhibition about the living rooms of people from Malaga. This is very interesting to see as it displays the kind of art people have in their living rooms! Tuesday – Sunday, 10 am – 2 pm and from 6 pm – 9 pm. Always free entrance to this museum. If you’re into modern art, then you need to go to the Contemporary Art Museum. This exciting museum is located in the former Malaga Wholesale Market building which has a vast warehouse space of approx. 2,400 metres. This museum is only 7 minutes away from TEFL in Spain. 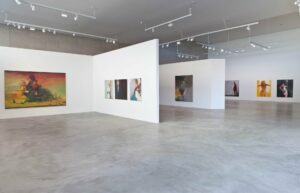 The museum has a permanent collection consisting of around 400 works which have been loaned by private collectors for periods of three to five years. Additionally, the museum organizes guest lectures, courses and workshops for all ages. So if you really like this kind of art, don’t hesitate and join a workshop! On the ground floor there is also a café and restaurant with an outdoor terrace, where you can have lunch or dinner for a reasonable price. 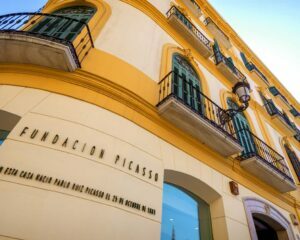 In Malaga there are two Picasso Museums – the Picasso birthplace and the Museo Picasso. The Picasso birthplace is located at Plaza de Merced and is free to visit on Sundays after 4pm. In the Museum however, you can see the area where Picasso grew up and also the house he used to live in. You can enter different rooms in the house. The Museo Picasso is located at Palacio de Buenavista and is also free every Sunday for the last two hours of the opening timetable. The Museum is quite new, it opened in 2003 which mainly consists of pieces from the family property of Pablo Picasso. If you want to see the big paintings of Picasso, unfortunately Malaga is not the right place. You have to visit Madrid or Barcelona, because these cities have the most famous paintings of Picasso. Picasso Museum: Sundays during the last two hours of opening. Probably the most outstanding museum in Malaga from the outside. The museum is located nearby the port and is a remake of the famous Pompidou Museum in Paris. It was founded in 2005. Originally the museum was not intended to be a museum but a parking garage. If you like modern art Pompidou Museum, then this is the place for you! Every day from 9:30 till 20:00. On Tuesdays the museum is closed. Every Sunday from 16:00 to 20:00 you can have a free entrance to the museum. On the last Sunday of every month in the beautiful Plaza de la Merced, you can visit the local market that contains of a lot of handmade products as well as clothes, jewellery, books and much more. After you stroll through the market, you can grab some food or go for a drink in one of the most amazing restaurants and bars that are located at the Plaza de Merced. Inside this beautiful building that back in the days was used as a shipyard, nowadays it is used as a the famous food market. The market contains many different types of food such as fruits, vegetables, meet and fish. They are all located in different sections. The best time to go to the market is in the afternoon because the prices will drop by the end of the day. Make sure that you also check out the amazing architecture of the building and you taste the local food at the many tapas bars inside! Every Sunday you can go to the port of Malaga to discover el Zoco de Muello Uno, a market where you can search for all different kinds of stuff including clothes, handmade gifts and cheeses. The Port is located very close to the old town of Malaga. It is easily accessible and it even has an underground parking. Paseo Marítimo Ciudad de Melilla. In Malaga there are two big fortresses – Alcazaba & Gibralfaro and both are definitely worth seing. One of the best reasons to go to Gibralfaro is due to the amazing views. The Gibralfaro has two viewpoints. One is located in the back of the Gibralfaro that is free of charge every day. There is also one more located on the top of the Gibralfaro hill that normally costs €5. On Sunday there is free entry to the top view pon. If you don’t fancy walking you can also take a bus to get to the top and enjoy the amazing views! Tired of walking? Grab a nice cup of coffee or a tinto de verano at the top point of the Gibralfaro in the little cafe! This park is located 10 minutes away from the school, in this park you can also find one of the outdoor gyms. It’s a beautiful big park with a lake, very close to the beach. It is adapted for bikes and has a playground for kids and a dog area. This is a eally nice place to find your peace when you are done with studying and when you just want to relax! A wonderful, central park nearby the port. 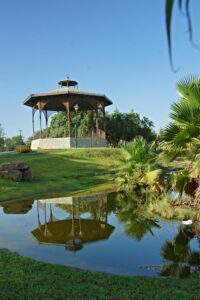 The park is 800m long and includes different types of trees, for instance palms and exotic trees. There are also different many beautiful statues situated in the park itself. In the park you can also find an outdoor theater were many music events are held. In summer they organize parties or theater performances here too. With warm sunny days this is the perfect place to go and walk in the shade the trees. 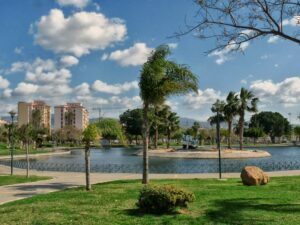 The park is only a 15 minutes walk from TEFL in Spain so it’s perfect for a nice break during your course, or to simply clear your head after all the studying. 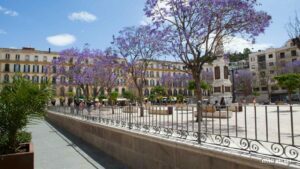 Plaza de la Merced is perhaps the nicest square in the city of Malaga and located towards the back of the old town. It’s a popular meeting point for locals (Malagueños) and there are a lot of cafés, bars and resaurants surrounding the square. When there is a football match, all the brs around the square are filled with football fans. The Plaza is located next to the birthplace of Picasso. Interesting fact: you can find a statue of Picasso on a bench at the square. The story goes that when, as a woman, you rub his head, you will get pregnant very soon! In the center of the square there is an obelisk, a memorial to the freedom fighter General Torijjos and his 48 fellows. Every last Sunday of the month there is a market on the square with a wide range of handmade products, it’s really worth to go there and take a look! 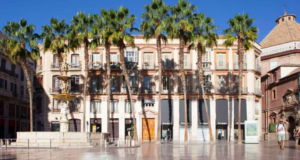 At the top of Calle Larios, the most famous shopping street in Malaga, you can find Plaza de la Constitucion. Until the 15th century this was the historical heart of Malaga. When there are events in the city, this square is often its central point. It’s one of the busiest squares in town so you definitely won’t feel alone. It is a good base and starting point to explore the rest of the city. Plaza de La Marina is located across from the main entrance to the port. When visitors from, for example, cruise ships arrive to the city, this is possibly the first thing they see. The tourist information office of Malaga can also be found in this square. They provide useful information about the activities and sights in the city and its surroundings. Plaza de la Marina is located in the central part of the city and it’s a good place to decide where to go next. Are you currently in Malaga and interested in starting a career as an English teacher? If so, why don´t you pop in and see us to find out more about the TESOL qualification and course dates that we offer. We have 4 and 8-week (Trinity College London accredited) courses! Nobody can explain how intense this course is. It is extremely intense and very demanding but the whole TEFL in Spain team are incredible and very supportive. I have thoroughly enjoyed my time here and have had the pleasure of meeting some truly incredible people – friends for life!